The McLeod’s wanted to maximise the space in the room and create an open and airy atmosphere. 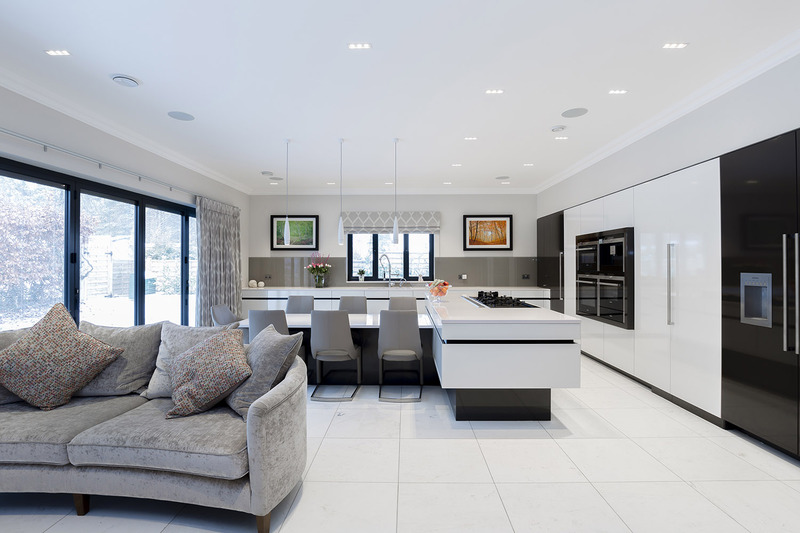 They were looking to create a sleek, handleless, focal point kitchen that incorporated a huge walk-in pantry as well as a large island and dining for at least 6 people together with a family room for the kids to watch TV. They are sociable people and often have visitors or their daughter’s friends round so needed space. The McLeod’s saw the Leicht display in Kitchens Internationals showroom; they were blown away by it and wanted something similar. They wanted to maximise the space in the room and create an open and airy feel. 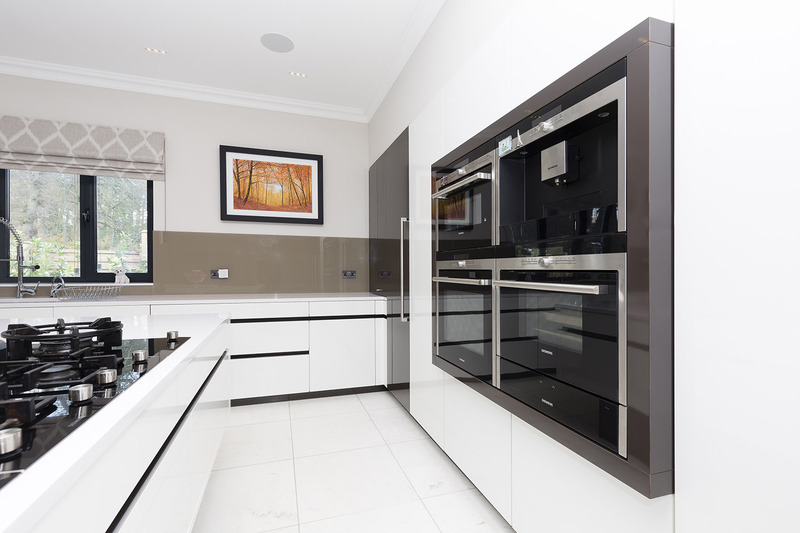 As keen cooks, they also wanted to incorporate a number of domino hobs into the design to suit different styles of cooking, as well as a downdraft extractor. 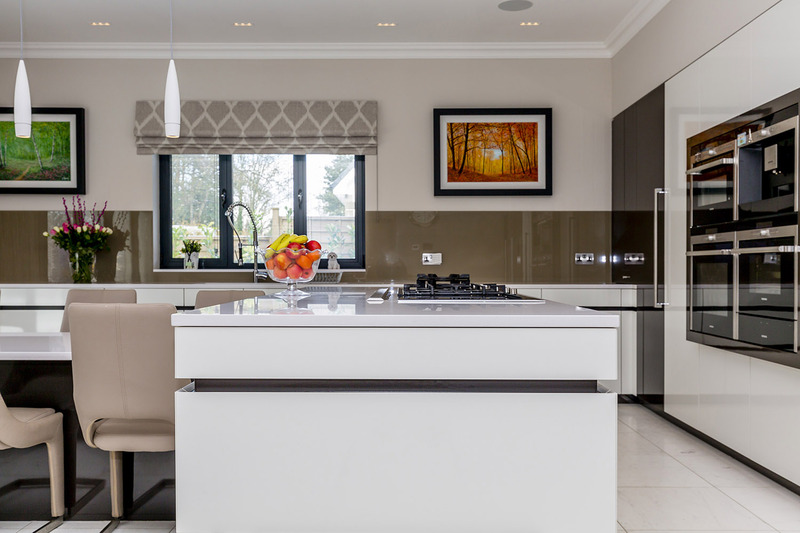 The design features a stunning island and dining area using Leicht’s AMICA-Avance Frosty white and sepia brown furniture and a 30mm White Storm Silestone Worktop. The combination of the gloss white cabinetry and softer sepia brown works extremely well and creates a sense of warmth and depth. 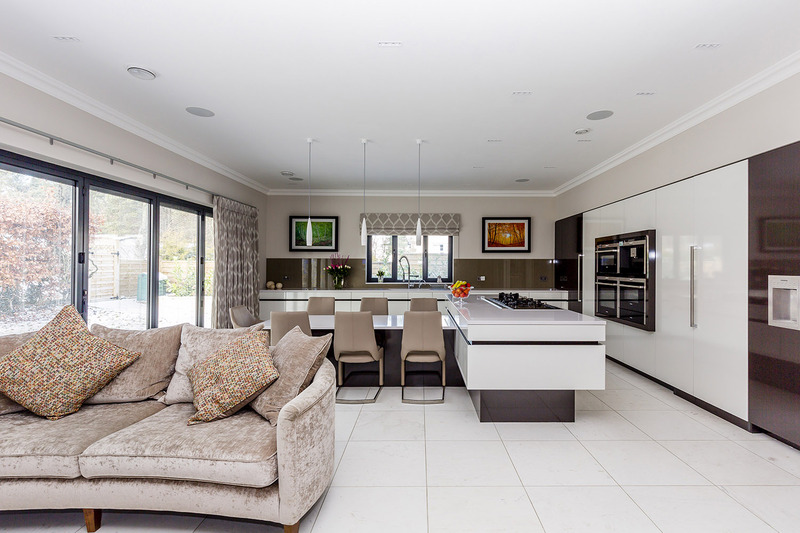 To create a social space for entertaining and family life, the cooking zone was placed on the island facing towards the dining and living areas. 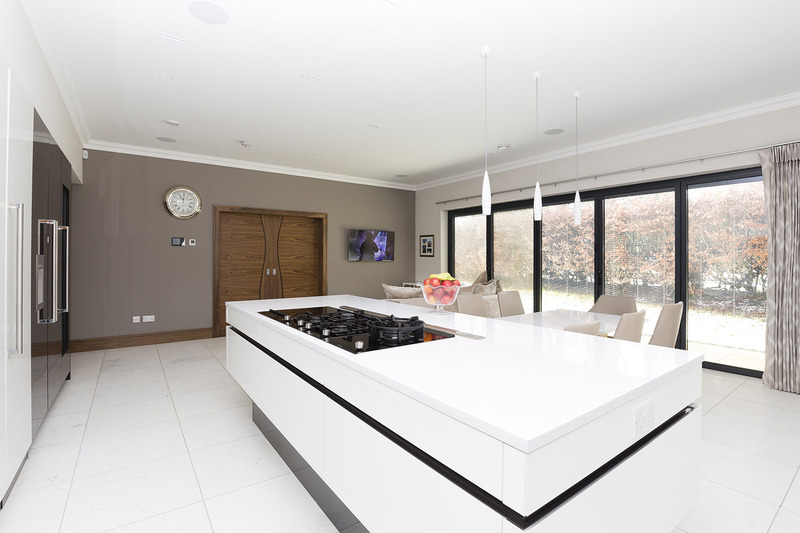 The cooking zone features four Siemens domino hobs, with options for gas, induction and teppanyaki style cooking. The walk in pantry is the hidden gem of the kitchen, it opens out behind the bank of tall units to provide ample, easily accessible storage. The pantry is fully lit and has wire storage racks on wheels inside it to allow easy access to the goods. 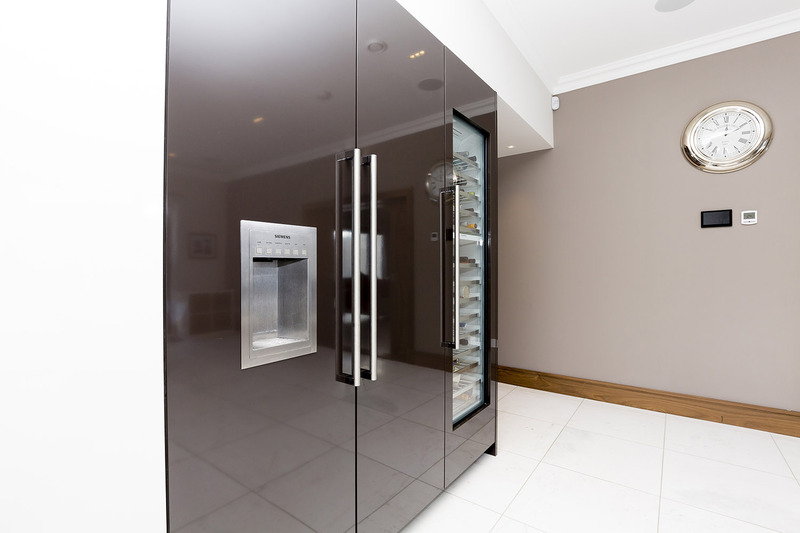 This additional storage allows the kitchen to remain uncluttered and provides additional worktop space for food preparation. 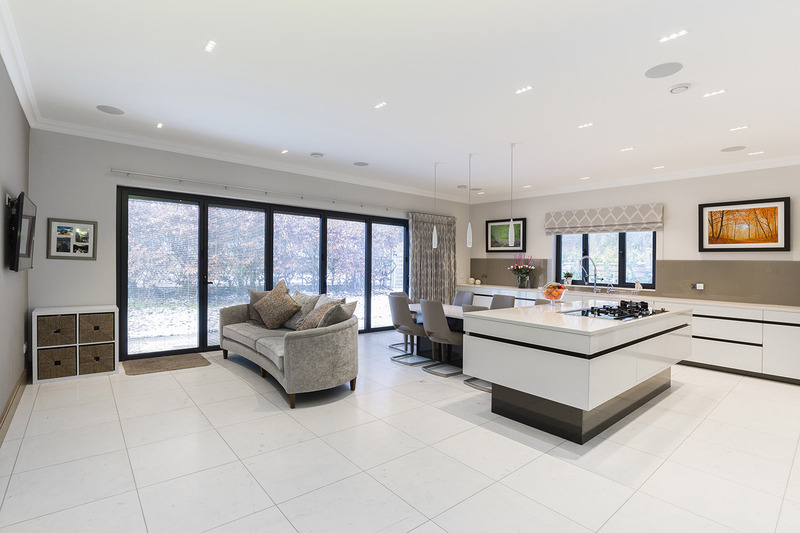 A Lutron lighting system was installed, allowing the McLeod’s to easily switch from ambient to task lighting. 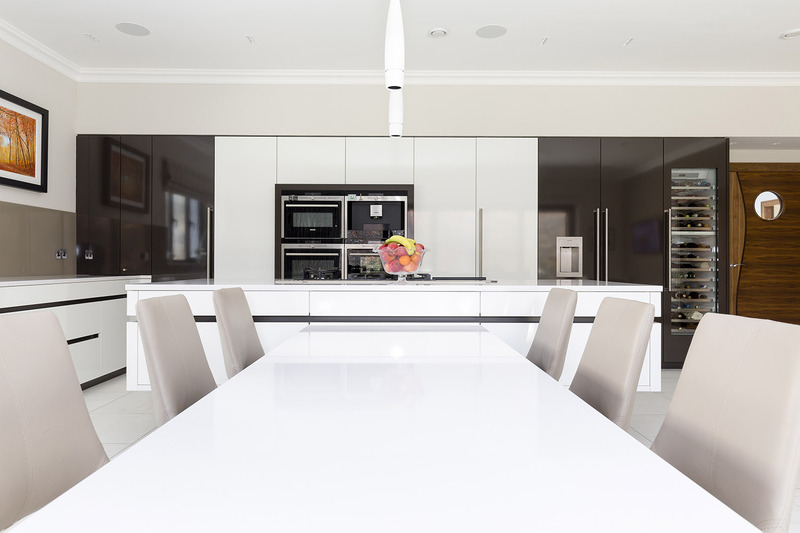 “We were delighted with our final design and installation and the complete professionalism shown from the KI Team from Sales to final hand over, we have recommended KI to all our friends and family”.